Happy birthday to all those winter babies! Got the blues thinking about planning your little one’s birthday party during the dead of winter? Wishing you had a July baby and could throw a pool party instead? Well fear not, my friends! I’ve got a January baby, and I’m here to tell you that a winter birthday party for baby can be just as awesome as one in the summer with some simple and fun winter-y ideas! It’s cold outside, so why not throw your child a winter wonderland party inside? When my daughter Ariella turned one, I decided to throw her a Winter One-derland themed party. Granted we live in Los Angeles, so it wasn’t exactly frigid here (I think it was 50 degrees—that’s practically the Arctic for us! ), but it was a blustery, cold day, great for staying indoors and warming up with friends and family! You may have spotted Ariella’s Rustic Winter Wonderland Party in the gallery, and today I’m going to give you the scoop on how I pulled it all together. A winter wonderland theme is a fantastic idea for a child of either gender. 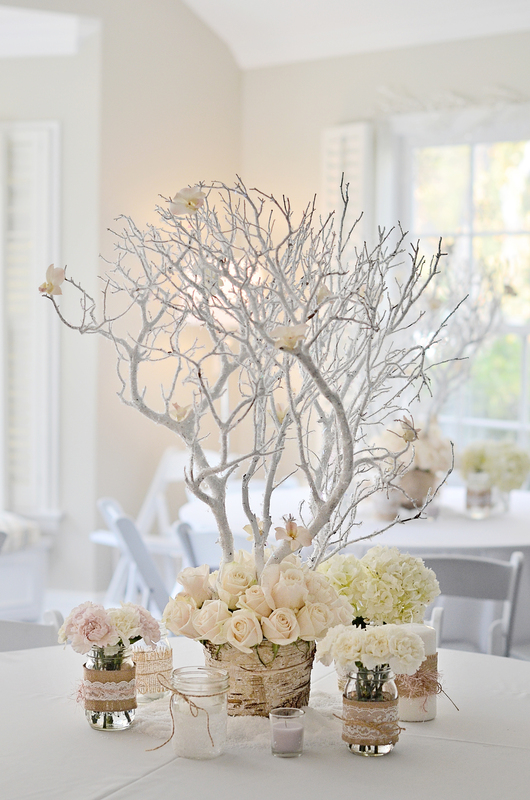 My winter baby is a girl, so I made the party girly with a mix of pink and white snowflakes and snow-covered trees, but you could easily make this party for a boy by swapping the pink for shades of light blue and aqua. Invitations. 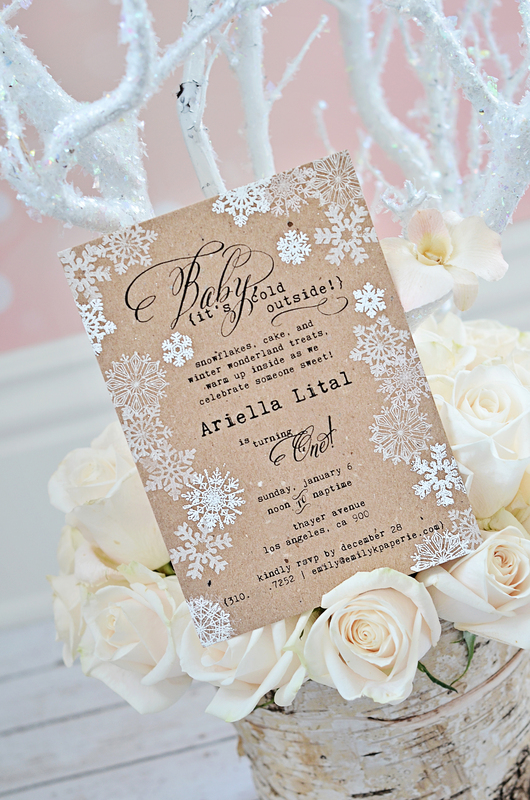 To set the tone of the party, I created shabby chic winter wonderland invitations out of kraft cardstock and stamps. I adored those invitations, but my, oh my, were they time-consuming to make! I hand-stamped and embossed each one—crazy, right? Well, I’ve gotten smarter as time has passed, and I recreated the same design as a printable PDF for you to download and print yourself (without all the hassle!). Hot cocoa bar and s’mores. A great thing to add to your winter wonderland party is a hot cocoa bar. It was a smash hit at my party, and the guests drained the hot cocoa tank dry! I created this Hot Cocoa Bar sign to display at my bar and had gourmet marshmallows, peppermint spoons, caramels and tons of great fixins’ for a truly delicious chocolatey experience. We made indoor s’mores in the toaster oven. 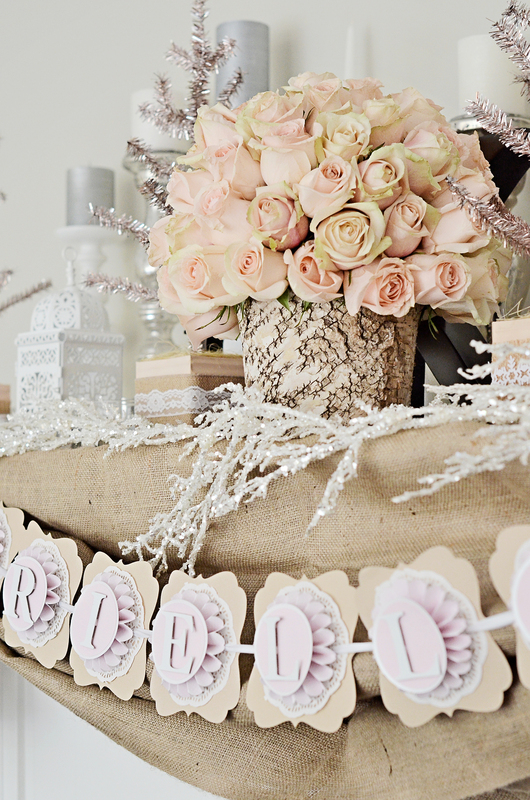 They were the perfect sweet treat for our dessert table! Decor. I turned our home into a winter wonderland of its own, complete with fake snow, bottlebrush trees, tea lights, faux snow globes and glittery snowflakes. I made DIY Manzanita branch centerpieces, and you can follow this tutorial to make some of your very own using Plaster of Paris. I also mixed in elements of burlap and lace to create the rustic, shabby chic feel. I wrapped mason jars and candles with burlap, twine and lace and placed those smaller arrangements around the base of my Manzanita centerpiece. I added some fake snow around jars to finish off the look. 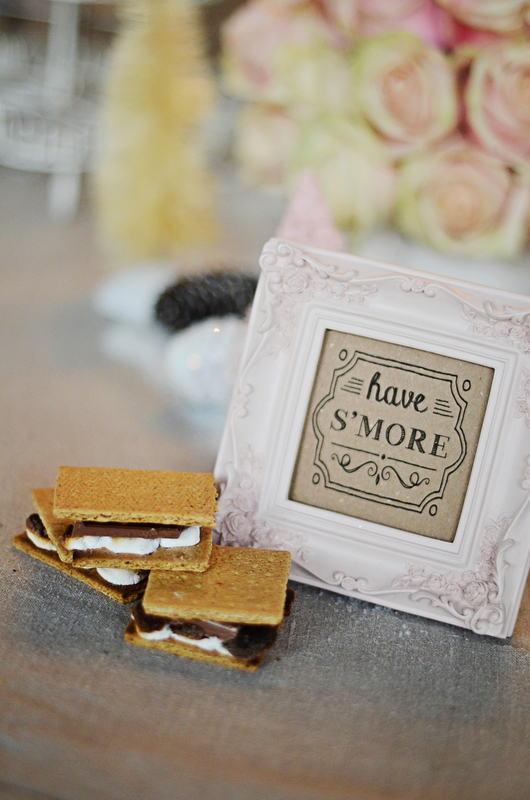 To go with the rustic/shabby chic feel, I also used chalkboard style elements in some of my party signage. 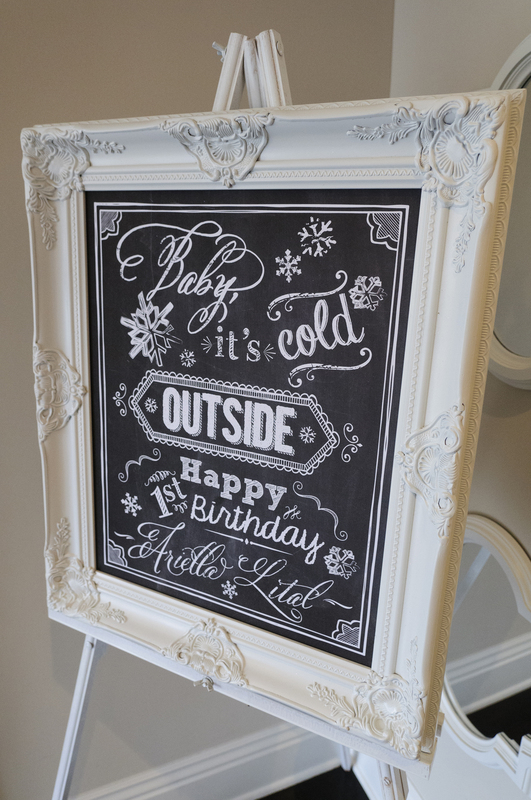 I created this chalkboard welcome sign, which is completely customizable for your child. Now is also the perfect time to shop the holiday closeout sections of stores! 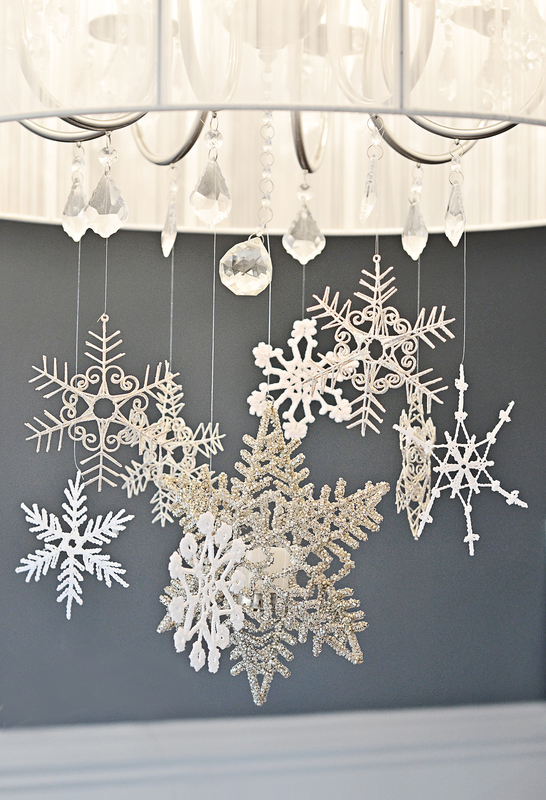 I snagged some awesome snowflake ornaments at 80% off! Hang them from a chandelier or as a garland to decorate for your party. With these tips and tricks for planning the perfect winter birthday party, I hope your little one enjoys the kind of celebration that sweet dreams are made of! That’s a good point that a winter wonderland part is gender neutral. That could really open up your decorative options. I bet it’d be really easy to adapt a venue for that look in the winter- businesses tend to theme themselves for the seasons anyways. 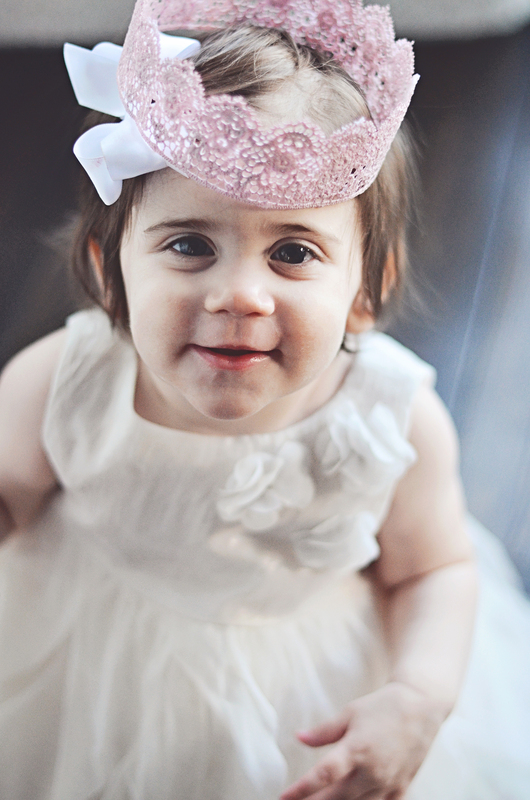 Loved your birthday party ideas and thanks for sharing your daughter Ariella’s birthday party story. Good day.